Your cat-ski choice: a week up in the alpine or just pick a day…or two. t’s an age-old question. Some believe the Mayans were the first to ask it. Herodotus, the ancient Greek record-keeper, may have even alluded to it in his epic text, The Histories. More recently, prime ministers, presidents and dictators alike have scratched their heads over the immeasurably dire quandary: If I go cat-skiing, do I want to tack a day or two onto a resort ski trip, or blow the holiday budget and stay exclusively at a cat-ski lodge? This delicious question was put to me, and answered, last winter with K3 and Chatter Creek helping out on the research. Happily, I am. They check my name off the list for K3 Cat Ski’s Revy pickup for the day. Penny Goddard and Jessica Taylor are guides whose daily routine revolves around collecting errant cat-skiers each morning at various locations around Revelstoke, though this is where they do their morning meetings and grab lunches. I get myself a Southwestern burrito and cinnamon bun while the rest of my crew rolls in: skiers Marcus Caston and Leah Evans, and photographer Bruno Long. We sip coffee in our Gore-Tex—this town’s most fashionable wear—while we wait for our lift. Just when most people begin their commutes to work, we commence ours into the Monashee Mountains. 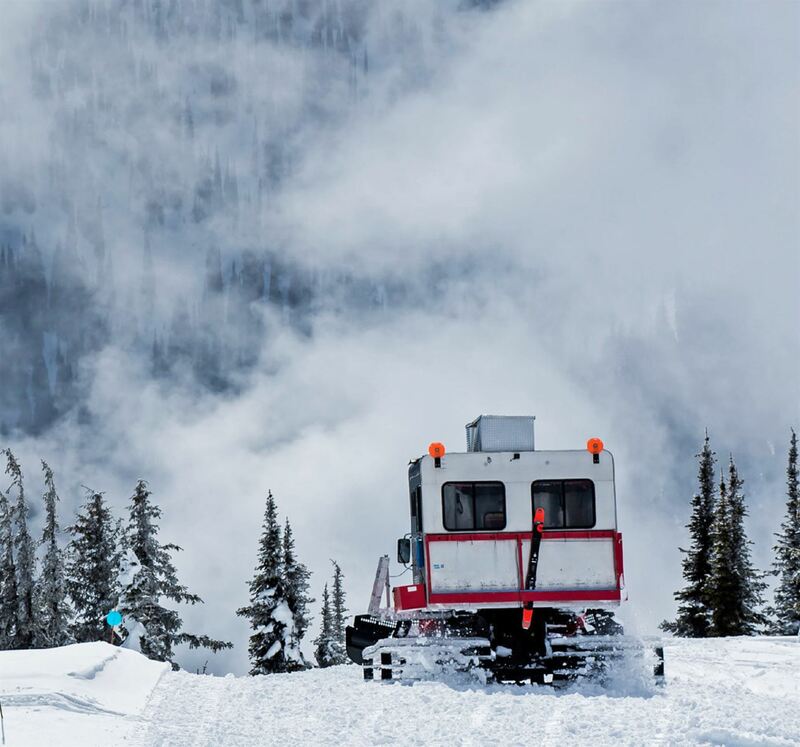 K3 Cat Ski operates in Malakwa, B.C., about halfway between the Victorian epicentre of backcountry skiing that is Revelstoke, and the village of Sicamous, B.C., on Shuswap lake—the summertime houseboat capital of Canada (just try to prove them wrong). K3 owners and operators David and Kris Moore and Rod Bailey live in Sicamous, but also keep an office in Revelstoke, so the company does pickups in both towns. It’s about a 30-minute drive in a cushy Toyota Sequoia from either hamlets to get to the snowcat staging. Our guide, Goddard, doubles as chauffeur, and chats about family life along the way. It’s somewhat of a rarity for a ski guide to be able to come back to her own home each night, and she loves it. Once arrived, we’re paired into groups for the day and meet our wily tail guide, Andy Adamson, a broad-shouldered, husky-voiced mountain man whose energy eclipses everyone else’s. 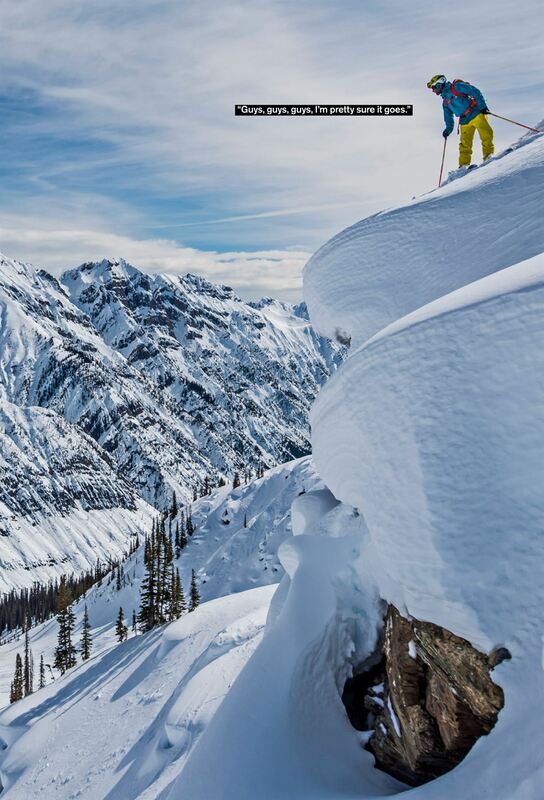 Caston, a Salt Lake City-based freeskier who spends most of his time filming for Warren Miller Entertainment, is completely smitten with the down-home feel of the entire operation. “I’ve never seen anything like this,” he says. We load into the cat with our fellow skiers for the day, and Evans and Long get to work with introductions. There’s a dad and his teenaged kid from Toronto, a couple of Brits, a couple of Americans and us. Meanwhile, tail guide Adamson squiggles drawings in the frost of the window and lays some ground rules. “Okay, here’s Penny’s track,” he says. “Now check this out: The powder right here…” he squiggles another line next to Penny’s track, “is just as good as the powder over here…” he squiggles a far-off line that trails away. “The trouble with the powder over here…” he continues, pointing to the far line, “is that we lose you, and you ski into a ravine and maybe die, and then everybody’s bummed. Let’s not get bummed today, okay guys? We stay tight, best time ever!” The entire cat is in giggles, but heeds his directions. Amid the laughter, I ask, “Your shovel should break?” He pauses, looks up and thinks for a second. “Uh, that wouldn’t be good, actually,” he answers, “but you gotta go fast!” He dives back into digging. From the ridgetops and cat roads, we have clear views of the terrain. In the high alpine there are chutes, couloirs and open bowls, but not in the kind of imposing mountains that bear down on you: all looks open and appealing. It’s perfect cat terrain, with both subalpine passes and cols that link one area to the next. Everything up high is caked, and compared to the warm highway in the valley below, we’re in a three-metre snowpack up here. Goddard starts us off right in the alpine. “It’s good stability today, guys, so we’re going right for it,” she says, as the group lights up. Our first run, a humble 300 vertical metres, takes us down Bob’s, a warm-up run that meanders at low angle from the mountaintop into the trees and snakes down through poppers that turn the whole group into bouncing oompa loompas. A quick jaunt back to the summit via the diesel feline brings us to Ghost Trees, a similar run, only with caked alpine flora—commonly known as snow ghosts. Then it’s on to Bella. “This is going to bring us around into another zone,” says Goddard. The cirque is replete with spine features on which the guests play out their ski-movie fantasies. These skiers are strong and the conditions are right; Goddard doesn’t hold anybody back. In between runs we dive indiscriminately into the lunch cooler full of wraps, sandwiches, drinks and cookies. And after a full day of pow shredding, we’re still back in Revelstoke with time to have a full evening of whatever we want. Though, all I want is sleep. Day two follows the same pattern, but, for expediency, those who were here for the first day of avalanche training skip it and get right to skiing. 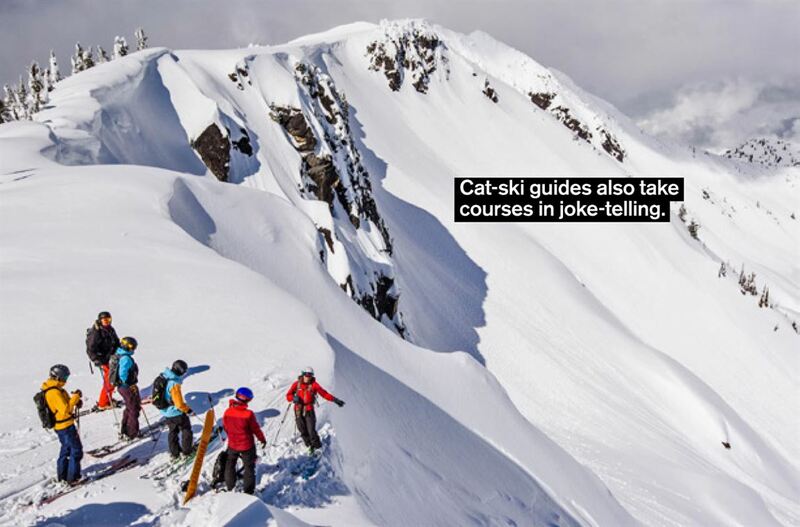 The guides pair any repeat skiers into the right cats for their ability and speed. We start the day on Bella again, but quickly move over to an area called South Park, at the far reach of the tenure, where we spend the rest of the day. The alpine rolls lead down to burnt forest and deliriously long runs to valley bottom that we ski in pitches of 300 metres at a time, to about 900 metres of total vertical. Toward the end of the day, when it’s time to rally back to the cat for our departure, tail guide Adamson blasts by with an extra pair of skis strapped to his pack. “Follow me!” he yells. The other group’s tail guide is taking a shift driving the cat, so Adamson volunteers to take his skis down—for some reason. 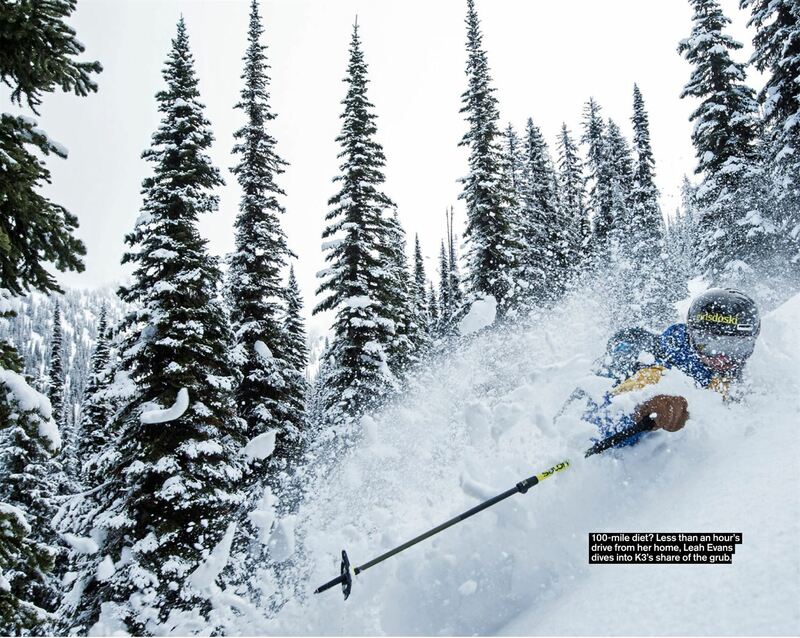 Next, Adamson hits a bump and ejects forward, spearing upside down into the snow, hanging by the two skis on his pack. Photographer Bruno jumps to his aid, unclipping him from his pack. Adamson falls to the ground like an ejected fighter pilot hung up in a tree by his parachute. After more than 5,000 metres of skiing for the day, it’s easy to get shaky legs. “We’re lucky geographically,” says owner Kris Moore. “Our tenure is easy enough to get into that we didn’t need a lodge right away.” K3’s founders were originally in forestry and had winters off. They became avid backcountry users and decided to make a business out of it. Ten years later, plans for a lodge are taking shape, but Moore says they’ll keep the day-skiing as well since it’s a nice flexible option for many guests, and K3 enjoys introducing people to cat-skiing at a lower commitment level. 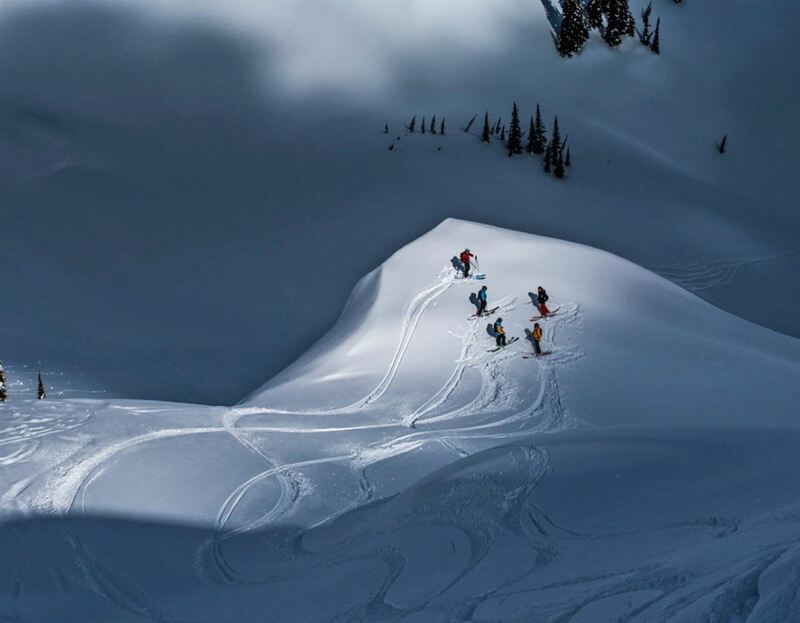 Further plans include a small ski-touring hut, making a trifecta of options for those looking to get into Malakwa powder. There’s a whole lot going on in the ghost town of Donald, B.C., on this sunny spring morning. Today it’s staging for Chatter Creek, but in the late 1800s it was a major switchyard for the Canadian Pacific Railway, and then the site of one of B.C.’s largest sawmills until the 1980s. That millwork eventually migrated to the nearby lumber and logging town of Golden, where you’ll also find Kicking Horse Mountain Resort and a healthy concentration of backcountry-skiing businesses. Chatter Creek is well-known for its challenging terrain and some infamous cat roads that top seemingly impossible peaks. Despite being situated on the western edge of the Rockies, it benefits from a far deeper snowpack than its closest comparable ski-resort cousins. Depending on elevation and what area in its tenure, the snowpack can be 2.5 to 3.5 metres deep—and helps bridge out several glaciers as ski runs. Freeskiers Chris Rubens, TJ Schiller and Colston VB accompany photographer Bruno Long and me in the 15-minute helicopter ride to the compound, which houses 36 guests and 25 staff at a time. Two main log buildings with footprints the size of multiple tennis courts connect to form the lodge, with a causeway between them. A separate row of log outbuildings also accommodates many employees, then there’s a sauna, a mechanics shop and the heating house, which pumps warmth into the main buildings from a giant wood-fired furnace. The place is so comfortable so far off the grid I’d gladly live out the zombie apocalypse here. The operation was built by loggers, who in 1999 secured a tenure and harvested the wood for the buildings right on-site. Today, original founder Dan Josephson is still commonly at the lodge, but Marketing Manager Isabelle Thibeault was equally there from inception, and recalls the epic ensemble of volunteer friends from Golden who came together to make it happen, just because they believed in the idea. Meanwhile, there’s hot chili out, a friendly bar to mingle at, giant rooms and massages. The first night we meet our guide, Brodie St. Julian, and tail guide, Valérie Marticotte, over the first of many memorable dinners. Morning is a little fuzzy, but the group stretch session the lodge offers helps with that. After a hearty breakfast comes avalanche training. It’s thorough and to the point, but without wasting any time. Everyone is here to shred. Next, we load cats and rally right to Super North, the heart of the alpine. Jagged peaks protrude in all directions, many of them with cat roads on them. The most notable among those that we’ll come to see is Vertebrae Ridge, the most famously aesthetic landscape feature of the area, showing off Rocky Mountain thrust faulting as though from a geology classroom. The skiing in our own group is predictably rowdy, so we’re treated to a separate program—standard practice for anyone who can fill a cat as a self-collected group. Our first run is a bowl feature that leads to several benches and treed cliffs below. All told, 800 or so metres. Schiller and VB make with the aerials off the top, while Rubens exercises his precise big-mountain acumen on more technical features. St. Julian and Marticotte monitor closely, but quickly gain a trust in our group that sets the tone for the following days as we link pitches together with minimal pausing. We get to know this zone, and lap it for the day, working its flanks for fresh new turns each time, allowing our skiing to grow with confidence. Another boozy night of deliciously rich food ensues to replenish our carbs for tomorrow. Throughout, some of the staff join the guests having late-night fun with foosball and pool—their jobs seem like the best-ever. I overhear a 30-something tech-industry worker from Seattle mix it up with a plumber from Calgary at the bar, “Man, this is just what I needed,” they tell each other. Behind them the tickle trunk comes out and the ladies play drunken dress-up around them. Late nights translate into early mornings, but the skiing is unmatched here so not a single person is late. If you like big terrain, and adventurous guides who want to get you on it, there’s nowhere better to be. But it can be a tough vibe to keep up with, too. Chatter Creek is famously aggressive in this regard. It’s full throttle, full time: at dinner, at the bar and on the slopes. Our dishevelled group gets no breaks from St. Julian, who managed to go to bed early and has no sympathy. He brings us to Derkaderkastan for the day, which is a longer version of Super North. Similar antics play out, and we plan for glacier skiing the next day. With 1,200 metres of vertical already behind us over two days, dancing shorter runs up high tomorrow will be a welcome relief. For our final day, St. Julian brings us to the Vertebrae Glacier, where an underground lake has drained into a magnificent ice cave that could swallow a house. After some time jibbing inside the impressive cavern like kids on a first snowfall in Ontario, we punch our legs on a couple of final short hikes that St. Julian insists will be the exact right closing notes. “This is why I love Chatter,” insists Rubens, whose tree-trunk legs laugh at the rest of ours over the well-worth-it final run. The next morning’s reluctant heli-ride out gives us views of some of the proudest peaks in the land: Iconoclast, Sir Sandford, Mount Columbia… Everything about Chatter Creek is big—including leaving. One could argue the price difference between staying at a ski resort and day-cat-skiing vs. a week in the alpine at a cat-operation is pretty comparable. The transportation to the lodge, accommodation, dinners and breakfasts (lunch is always included) make up most of the monetary difference between the two. Every operator curates a unique experience according to distinct terrain and snow, so you have to decide what you like best. To make your best call on staying or day-ing, it’s easiest to start from the baseline of skiing. Look at what kinds of groups ski what kinds of terrain, and how many people fill a cat. Next, figure out how much you want to add on, or how flexible you need to be. If you’re looking for the bare bones experience of the skiing, you can have an equally epic experience by the day, feeding yourself and finding your own accommodation in between, and perhaps saving a few bucks that way. It’s also handy if you’re into hitting the town since places like Revelstoke do bump at night. Day-ski operations are also usually more open with availability and can book you in closer to the time. If you want to bank on catching the right conditions, or perhaps pair with a day or two at a resort, or stay serendipitous in your planning—this is the way to go. You also save half a day to a day on either end of your trip since there’s no staging into the operation: you ski the same day you go in, which is not often the case with stay operations. On the flip side, flying or snowcatting farther up into a remote zone to a private lodge tends to bring you to bigger, more remote mountains, sometimes with more snow. If you want to unplug and not have to think about any details for yourself, this is the way to go. You’ll be treated to the highest quality meals with no effort, and stay in comfortable but rustic digs you’d have a hard time duplicating in town. Stay operations have more time to adjust groups according to ability over multiple days, too. And, by the time you’re there, it’s quicker to get skiing each morning, plus you can come back a little later and chill out faster. The lodge experience is also a bonding one. Get to know your compatriots and other guests in the hot tub, over dinner or at the bar. Perhaps you’ll even fall in love—there’s nothing like being out alone in the woods in the winter to get the hormones stirring. And if yours aren’t already, maybe it’s time you get cat-skiing.